For the Egyptian leadership and Hamas, February was a particularly bad month. The tension between the two sides has reached tipping point. The cascade of escalating events started with a court verdict listing Hamas’s armed wing as a terrorist organization and ended with another court verdict listing the entire Hamas group as a terrorist organization. This last verdict, however, is not final and may be subsequently squashed. Nonetheless, the possibility of immanent confrontation between the two sides seems close at hand. Despite this, the Egyptian leadership appears oblivious and ill prepared for such a scenario. After the ousting of ex-president Morsi, Egypt began to view Gaza as national security threat. Egypt accused Hamas of conspiring to overthrow the Egyptian regime and backing of al Qaeda-linked militant groups, which have stepped up attacks against security forces in Egypt’s Sinai Peninsula. Since that time, the Egyptian military has embarked on creating a security zone at Egypt’s border with Gaza. The planned buffer zone was initially planned to be within 500 meters from the border, but was later doubled to 1,000 meters. The width of this buffer zone expanded after additional discoveries of longer tunnels across the border. In mid February, Egyptian security forces claimed it discovered the longest smuggling tunnel to Gaza yet, at 2.5 kilometers in length. Last Friday, a senior Egyptian officer was killed when one of those tunnels collapsed. Closing smuggling tunnels is also coupled with very limited opening times for the official border point between Gaza and Sinai, which further limits the flow of goods and passengers. This is worsening the already dire economic situation along the impoverished strip and fueling tensions. 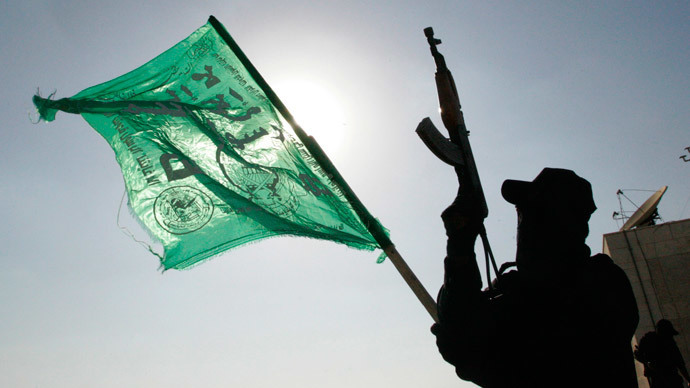 Historically, ending Hamas’s role in Gaza has proven to be tricky. Looking forward, there are three possible options: Gazans turn against Hamas, Abbas take-over control of the strip, and/or protests and divisions increases among Hamas cadres. Thus far, none of these scenarios have yet materialized. Some have held out hope for the idea of a Gaza “spring” similar to the “Arab spring,” but this is absurd for many reasons. First, Hamas still has support inside Gaza. After all, the group has its social network spread throughout Gaza. It has indoctrinated its youth in a culture of resistance against Israel and also against any Arab regime that tries to undermine the movement. Second, while it is true that many in Gaza are fed-up with Hamas’s tight grip on the strip, will they risk protesting against heavily armed Hamas security forces? This is unlikely. Therefore, it will be daft for policy makers in Cairo to bank on any future “spring” in Gaza. In contrast, the possibility of Abbas regaining control of the Gaza strip, which looked plausible after last August’s truce agreement between Hamas and Israel, also did not happen. Months have passed and Mr. Abbas did not (or could not) even visit Gaza. There is even an Israeli report suggesting that the Palestinian Authority thwarted an international initiative supported by the United States, Europe, and Jordan to radically change governmental control in Gaza. President Abbas may want to rule Gaza, but he may fear even more serious percussions in the West Bank, where Hamas still has many supporters. The possibility of divisions within Hamas as mentioned in Berti and Gold’s piece is plausible, but any divisions will be irrelevant as long as Hamas’s military wing is intact. It has become increasingly clear during last year’s confrontation with Israel that the armed wing, not the diaspora leadership, has the upper hand in decision making. This will likely to continue in the future. It is hard to imagine how a group with thousands of armed men, who believe that defiance is the key to survival, will voluntary accept any dismantling of their own power and control. Hamas’s military wing has already released a video asking “Why O, Arab?” They clearly feel angry and betrayed by Egypt. Meanwhile, Egypt el-Sisi ’s visit to Saudi Arabia, which coincides with the Turkish president Erdogan’s visit, has raised speculations about possible Saudi mediation going between the two sides. It is well known that Turkey is the current main supporter of Hamas. Therefore, in theory, any improvement in the already tense relationship between the two countries can help the besieged Hamas in Gaza. Nonetheless, in reality, any rapprochement between Turkey and Egypt is highly unlikely. The gap between the two sides is very wide and difficult to bridge, despite any sincere Saudi efforts. The Turkish president wants to empower Hamas at any price, even at the expense of Egypt’s security concerns. Last August, I wrote about the potential of indirect Egypt involvement in Gaza. However, without Abbas in control of Gaza, it seems that the stage of indirect involvement has now passed. As Berti and Gold hinted, the stage is now set for overt confrontation. “ We will resist any Egyptian aggression, like we resisted the Israeli occupation,” a Hamas official to Ma’an news agency. For Hamas, regardless of the final Egyptian legal verdict on its status, Egypt is now the new “Israel.” This is a chilling thought that Egypt has to take seriously. The Egyptian army may struggle to deal with rebellious, hostile Hamas in Gaza, just as Israel did. If a functioning Hamas is a security threat to Egypt, a dying Hamas is no less a threat to Egypt. This entry was posted in Best Read, Egypt, Gaza, Hamas and tagged Abbas, Egypt, Erdogan, Gaza, Hamas, ISIS, North Sinai, Rafah, Sinai. Bookmark the permalink.